If you are truly committed to keeping your body in the best shape possible, consider the Body Solid EXM1500S Single Stack Home Gym. On the market since 2008, this state-of-the-art gym is centered around a 160-lb weight stack that is adjustable in 10-lb increments and features five separate stations — high-, mid- and low-pulley, as well as stations for leg curls and chest presses, all built in to one convenient machine. This home gym offers you a full-body workout that will sculpt and strengthen your abs, biceps and triceps, legs, chest and back and you will be able to see and feel a difference right away. It is also easy to order and is available through Amazon for the low price of $889. Read on to find out more about why this home gym is the key to a beautiful, strong body. 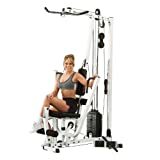 The five sections of this machine allow you to work out your entire body, and customers have been particularly enthusiastic about the back station which provides a lateral pull-down and seated row position. The Body Solid Gym is biomechanically engineered with an ergonomic design to encourage correct body positioning; this will give you both a safe and more effective workout and many customers have commented on how smoothly the machine operates. Measuring 36x83x49, one big advantage of this gym is its “small footprint” which allows it to fit even into a modest-sized apartment or condo. Body Solid backs up the quality of their work by offering a lifetime warranty to give you peace of mind when purchasing your home gym. Your purchase also comes with a lateral bar, a low row bar, a utility strap and a workout poster. A home gym of this caliber gives you the freedom to exercise whenever and however you want, and its quality guarantees that you are still getting a top notch workout. In just 20 minutes a day, 3 days a week you will be able to get a total body workout that will help you lose weight and strengthen and tone your muscles. The money you invest in this machine will be more than made up for by money (and time) saved on going to a gym. Assembly is required, and some customers have complained of the difficulty of constructing the machine and particularly about the similar-looking nuts and bolts. A careful read-through of the manual and setting out all necessary parts ahead of time is recommended. This machine does not come with an exercise manual, although a wall poster displaying 20 different exercises for your workout is included in the purchase. Another issue is that for some, the cable attached to the weight stack is too short. The manufacturer, however, can provide a D-link to insert inline to solve this problem. Some customers of above-average size have commented that this is machine does not allow for a great deal of room to maneuver. Taken as a whole, it is not surprising that the EXM1500S Home Gym by Body Solid was recently rated “#1 Best Buy” for home gyms in a consumer report magazine. Compact in size, the different features still allow for a wide variety of exercises to work out the entire body, and its ergonomic design makes this a safe way to exercise. So if you are looking for a home gym that will give you a strong and healthy body and allow you to exercise at your own convenience and in the privacy of your own home, the Body Solid EXM1500S may be just what you are looking for.